Decorative Ceiling Tiles stands behind its products and strives for 100% customer satisfaction. If for any reason you're unsatisfied with the products delivered to you, please don't hesitate to contact us in order for us to correct the problem, provide an exchange for a more suitable product, or to receive a refund. Here are our specific policies. Prior to purchase, it is advisable that you first order a sample of your preferred product to confirm that it will suit your needs, before committing to a full purchase. Because of the unique nature of custom made items, we regret that we are unable to accept returns for refunds for these items. Regularly in-stock items are usually returnable and refundable and will be noted as such in our catalog. Requests for returns and refunds should be made within 30 days of taking delivery of the product and can be subject to a 12% re-stocking fee with a $30 minimum. All shipping costs associated with product returns are the responsibility of the customer. Kindly contact us for questions about this policy and specific shipping instructions before initiating a return. When returns are made, we kindly request that you be sure to note the order ID on the delivery container and maintain all shipping supplies in the best manner possible in order for us to expedite refunded monies. We recommend that you carefully inspect the boxes or other shipping container for damage before accepting the delivery, or if noted later, contact us immediately to provide relief for damages from the delivery company. Take note of the damage that occurred to the container or of any of its specific contents. Although carefully packed to protect your products during this process, unfortunately we can't be responsible for damage that may occur once your product has left our shipping facility. We encourage you to contact any of our team members if you have any questions about the product(s) you are ordering and the return policies of these items before making your purchase. 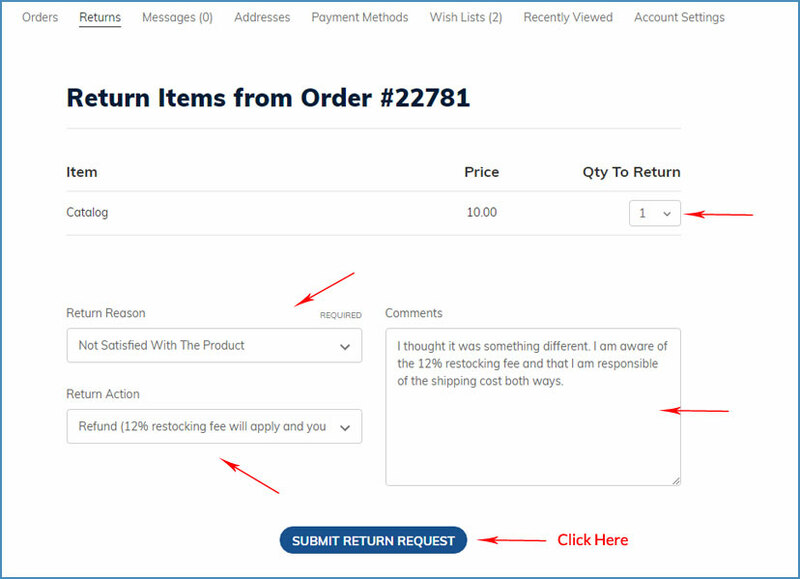 Here are the Steps you Need to Take to Return the Product if you have an account. Keep in mind that custom made items and samples are non-returnable or exchangable. View a list of items on which we accept returns. It is strongly recommended that you request a sample of these items so that you know exactly what to expect. We accept returns on in-stock items only within 30 days from recieving of the order. Also, keep in mind that there is a 12% restocking fee with a minimum of $30 restocking fee and that you are responsible for any shipping cost. If you do not have any account simply make sure it is ok to return it above, if it is write the order id on the box and send it to proper address listed in the step 7. Don't have an account or forgot your password? - skip to step 3 if you have a password. Here is what it will look like. At this point you are authorized to return your items. Make sure to pack the items exactly as they came. Be sure to insure the items for its full purchase price. 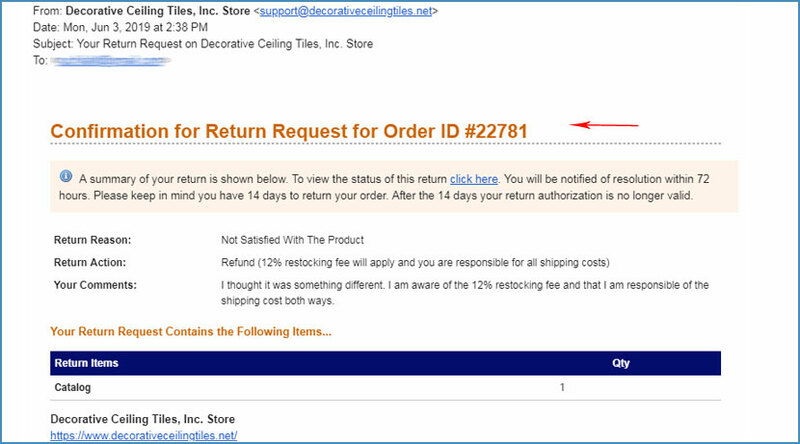 We try to process returns as quickly as possible but it may take up to 14 business days to get the refund or credit. Usually it is much faster though.